This is a one-step bowling ball cleaner and rejuvenator that restores that “tacky” feeling to the surface, and was specifically designed for all reactive bowling balls. Have pals who ask about ReactaClean, give them a demo on my reactive & hybrid reactive solid coverstocks, & they see how it improves ball performance on the lanes. Works great. gives the ball a clean tacky feeling. Just like new after each set. It even removes light tape and scuff marks from the lanes and setters. I like that this ball cleaner/rejuvenator is a one step process. Simply spray it on, wait a few seconds and wipe ball dry with a clean towel. Can ReactaClean be used during league play? Is it best rejuvinator for asymetric ball? 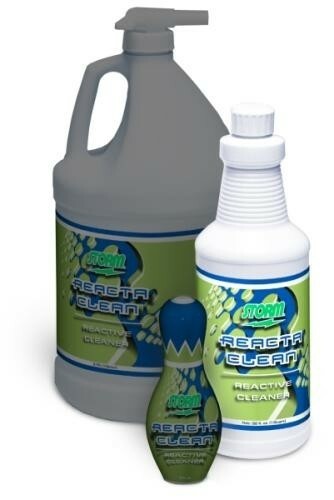 Is it necessary to use polish after using reacta clean? Yes, it is all USBC certified during league play. Due to the time it takes to produce the Storm Reacta Clean Quart ball it will ship in immediately. We cannot ship this ball outside the United States.